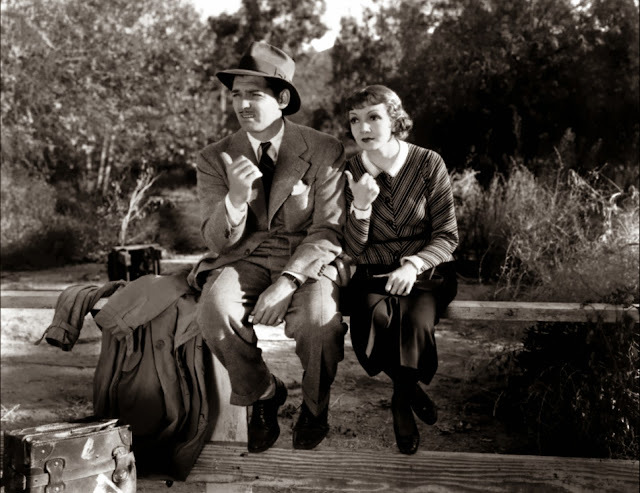 Squeaking past in the last year of Pre-Code Hollywood, It Happened One Night is all the more charming for the little innuendos it was allowed to contain, not to mention its half-dressed movie stars. Made at Columbia, (a minor studio at that time), the film went on to be a commercial and critical success, sweeping every major Oscar category in a manner that wasn't done again until 1975, with One Flew Over the Cuckoo's Nest. Capra's longstanding attitudes seep through; his dislike of airs and graces, of the wealthy's 'lack of humility', and there's certainly some Depression-era joy in seeing the prim socialite played by Colbert being brought low. She is forced to hitchhike, wear the same clothes for much of the film; sleep in the hay, eat only raw carrots. Gable is incorrigible and handsome as a newspaperman playing at being a gentleman; smoking in bed wearing a wry grin on his face. There is a lovely moment in the hay where he offhandedly insults Colbert and tears sparkle on her beautiful gamine face; it is a stymied moment of resistance to the increasing attraction between the two, emotion flowering in soft-focus close ups. Too charming for words, really.